Aged 86. Passed away peacefully on 25th March 2019. Devoted husband of Sophia and loving father of Nick and Jef. Forever in our hearts. Sophia, family and friends. A Funeral Service to Celebrate the Life of the late Mr Vaso Jakotic of Midland will be conducted in the East Chapel of PINNAROO Valley Memorial Park Cemetery, Whitfords Ave Padbury commencing at 12.30pm on MONDAY (01.04.2019). 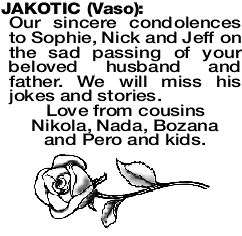 Our sincere condolences to Sophie, Nick and Jeff on the sad passing of your beloved husband and father. We will miss his jokes and stories. Love from cousins Nikola, Nada, Bozana and Pero and kids. 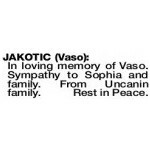 In loving memory of Vaso. Sympathy to Sophia and family. From Uncanin family. Rest in Peace.